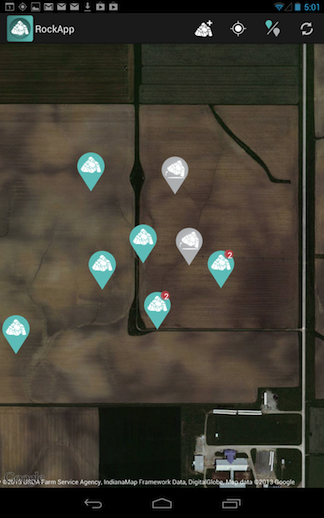 The Precision Agriculture Rock App provides a simple means of recording the location of rocks. 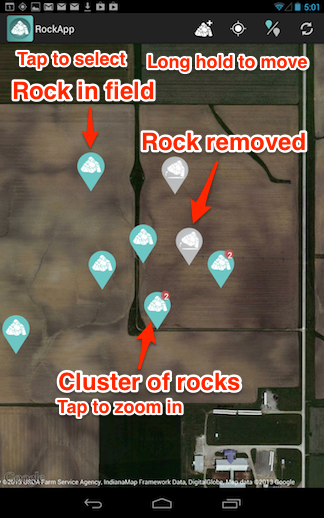 When an operator marks a rock with the Rock App its location is shared with other apps and other workers so it can be removed quickely before causing problems for soil engaging implements. 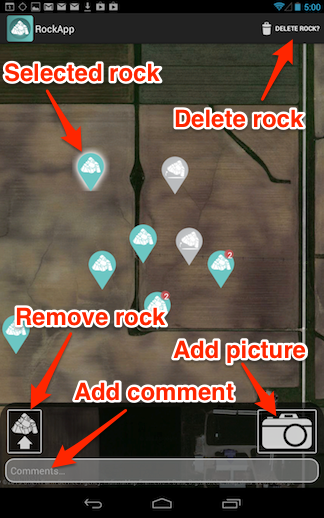 The Rock App provides a UI to easily mark the location of rocks for removal. 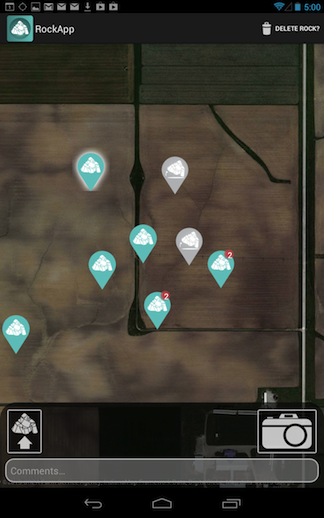 When an operator marks a rock, its location is shared with other devices on the farm using cloud storage so that it can be removed quickly. Another operator is likely responsible for the removal of the rock, and marks it as “Picked Up” once it has been removed. 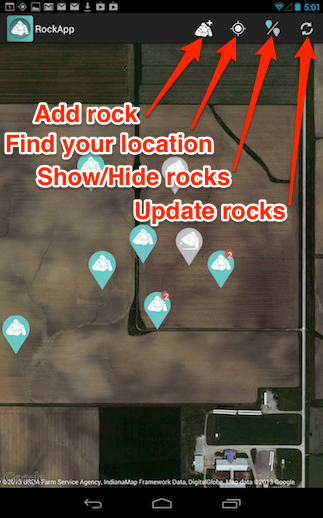 The location of rocks can also be shared with other apps where appropriate. Each app has its own Trello Board. You can join the mailing list, fork us on GitHub, and you can always email us for more information. Each app has its own development resources: functional specs, UI mockups, documentation, and code. Source code for the OpenATK Rock App is available on GitHub. Don't forget the Common Libraries. Send a message to the mailing list to get some feedback and convince the community to get it on the roadmap. We're going live at ASABE AIM 2013! More platforms: we're only on Android now. iOS will come as soon as we get some people to work on it. More cloud storage libraries: we've only got Trello support now. Dropbox's new Datastore API has caught our eye and moved them up the list ahead of Google Drive. More support and community: to give this project long-term stamina, we're actively seeking partners and community developers who would like to contribute. We are actively seeking contributors for this project and ISOBlue, so if you like either the concept or any of our apps, please contact us for more information. Site template modified from Bootswatch Cosmo. Site code licensed under the Apache License v2.0.